Sometimes life gives you lemons. And some people seem to think that happiness is a big old pile of money, so they’ll tell you that times like these are perfect for opening a chain of lemonade stands. But at your age, it can be really tough to get a corporate empire off the ground—let alone file the appropriate paperwork. Don’t worry, though: you could always turn the tables just by dressing in a terrifying Child’s Sinister Jester Costume like this! You hear that, everybody? The joke’s on you! Nobody gets to tell us what to do with an unforeseen surplus of citrus! Now you’re going to have to put up with our corniest, most groan-inducing jokes until we’re sure you've had your daily dose of Vitamin C. And in case it’s been a while since you reviewed the latest dietary guidelines, you need a lot of it! So we could be here a while. Especially since knock-knock jokes aren’t exactly packed with nutrition! Mua-ha-ha! Wow, maybe we should look into a couple of these costumes for ourselves. 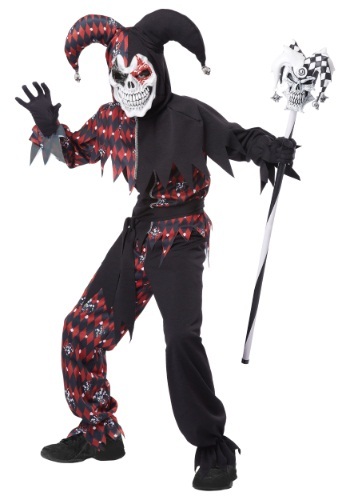 Who knew that wearing a black-and-red jester suit with a nefarious skull mask could be so cathartic? And who knew that we had all that rage underneath our characteristic playfulness and optimism? Not us! But we’ll sort that out later: right now, we’ve got to make sure you get one of these awesome outfits. They look great, and they’ll really put you in touch with your inner chaotic prankster!